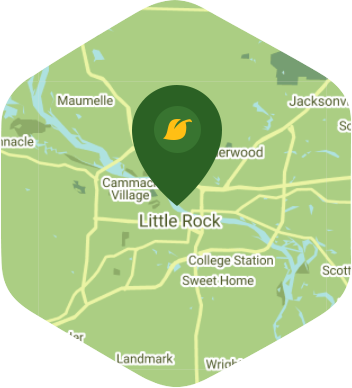 Book a skilled lawn pro in Little Rock. Backed by a total satisfaction guarantee and amazing customer support. The capital of Arkansas, Little Rock, is where you can find some of the country's best golf courses. It is also home to some pretty picturesque parks and wonderful museums. It also has some great pathways that are ideal for walking and biking. Simply put, it is the perfect place to plant your roots and raise a family. With so many things to keep you occupied in Little Rock, would you rather be stuck at home behind your lawn mower? The obvious answer is "no", so why not hire Lawn Love to mow your grass for you? With our lawn mowing service you can finally say goodbye to those busy weekends. Our independent lawn techs have all the skills and experience needed to mow any type of lawn. We take pride in using custom made approaches for every house we go to as this helps us get the best results for your lawn. All you have to do is just sit back and watch our guys go to work. You won't have to worry about running into anything complicated while scheduling your lawn mowing service because with our website and mobile app you'll only have to spend a few minutes of your time to complete everything. Give your yard some Lawn Love magic by contacting us at 501-251-6097 or by requesting for a free two-minute quote. Yard looks great. It was super wet from all the rain, but Kery took time to make it look good and got it done. Thank you! I got pretty scared when I drove up and saw the azaleas being trimmed while they are blooming, but the end result looks fabulous and the yard really did need it. Mowing looks great as well. Thank you! Jason did a great job and I appreciate the work. Thank you! Jason S. was the best lawn pro so far. He did an wonderful job, attentive to detail, very knowledgeable, professional. If all the previous pro's had his attitude and professionalism, wow, they would be the best also. Thanks for going the extra mile! The yard looks great. Did a great job wouldn't want anyone else thanks Kenny and the staff at Lawn Love. Kenny did a great job mowing and edging my lawn. He even used the blower to get rid of the other debris! Thank you so much. He turned an absolute mess into a beautiful lawn mowing up and down multiple times. Very courteous and professional. Jason was awesome, he communicated to me multiple times while on-site and suggested several changes to my bookings which I have made. I would prefer and refer him for all my future bookings. She went sooooo beyond! To say she went the extra mile is a understatement. My lawn care guy went an extra mile. I liked their job. I just want that they keep the schedule. Very friendly, professional, & has a great attitude I'm very pleased. Michael does a great job and is very reliable!! My lawn looked perfect! My pro went above and beyond to make my entire yard look great. Did a great job and gave me plenty of notice so I could get my dogs inside and make sure the gate was still unlocked. Highly recommend. I was very pleased with my lawn. Grass was cut the right length, bushes trimmed nicely, and everything set neatly by the curb. Did a great job, will hire again. Lawn was a little long to begin with so probably could have used a lower deck or a second pass but otherwise looks great! Paid attention to the little details like edging and raking which make such a difference! Rated 4.63 / 5 stars in 254 Little Rock customer reviews. It looks like the expected precipitation in Little Rock is 0.35 inches, which means your lawn got a nice soaking—leave those sprinklers off today. Dusk and dawn are the best times to water your lawn (the sun will rise at 6:26 AM and set at 7:48 PM today in Little Rock). Here are some average lawn care prices for homes in Little Rock. Average lawn size 5,833 sq. ft.